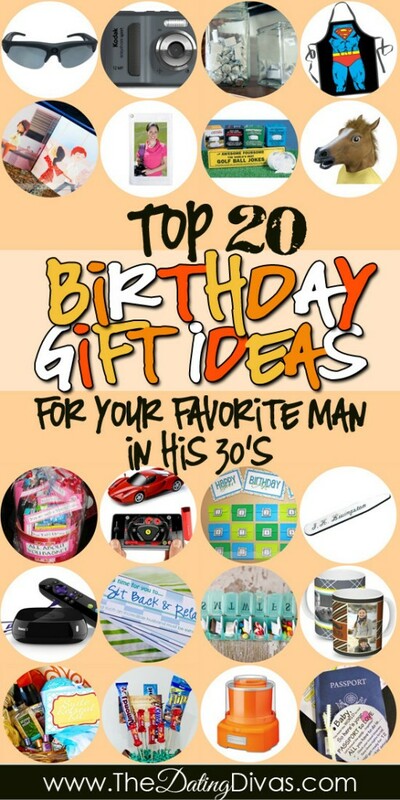 And we are SURE you are going to find some fantastic ideas for your man’s next birthday! 1. Video Camera Sunglasses – How cool is THIS? A unique wearable camcorder and polarized sunglass combination. Hidden in the frame of the sunglasses is a 3 megapixel videocamera that can record 2 to 3 hours of action. To view your footage, just plug it into a computer with a USB! AND they are water and sweat resistant so your man can capture his next hunting adventure or extreme sport trick- hands free! 2. 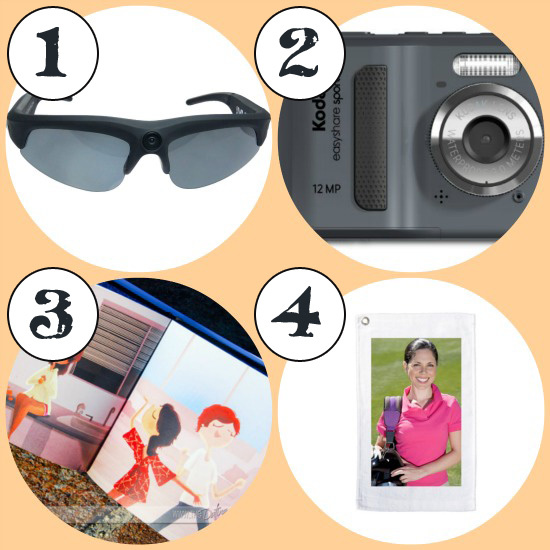 Kodak EasyShare Sport Waterproof Digital Camera – Does your man love the great outdoors? Let him capture his explorations without worrying about dirt, dust, water, or sand. Whether it’s a downpour on the hiking trail or a dunk in the pool, this Sport Camera lets your take your best shot- up to 10 ft. underwater. And with Kodak’s Share button, you can tag pictures directly from your camera for e-mailing to friends or uploading to popular social networking sites. 3. Create Your Own Storybook– Looking for something a little more sentimental? With this program you can re-tell your own love story in the form of a customized book and dedicate it to your Prince Charming. The site provides a variety of artist’s illustrations which you personally select, put in order and add your own text. What a great way to show your love – in a gift they will always treasure! 6. DC Comics Superman Character Apron – Is your man a kid at heart? Does he love cookin’ it up in the kitchen or on the grill? Then surprise him with this totally fun character apron and let him know he is still your Superman! 7. 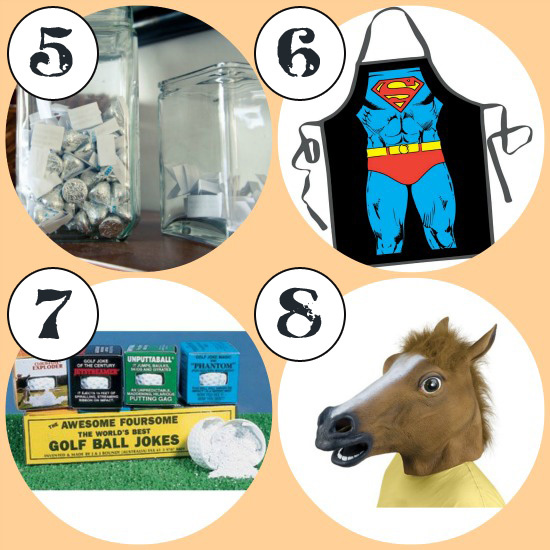 Golfers Gag Wacky Tricks Golf Ball Jokes Set – Is your man a prankster? Then he’s sure to love the world’s best golf ball gags! With The Exploder, The Phantom, The Jet-Streamer, and The Unputtaball- he’s sure to have some fun on the back nine. 8. Accoutrements Horse Head Mask – Speaking of pranksters… I about died when I saw this hilarious horse head mask Julie found. Now THIS is the ultimate gag gift. With 1,077 (extremely amusing) customer reviews- it has a 4.6 rating out of 5 stars! If your guy has a serious sense of humor, (and you can totally picture him sitting on the front porch wearing this crazy mask and waving at all the neighhhh-bors) then run and check it out. Hehe. 9. 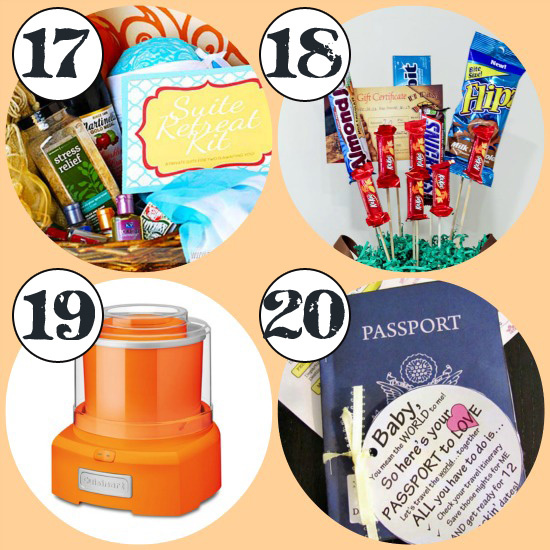 The All About YOU Basket– You can’t go wrong with this gift basket! It is one of our most popular and pinned posts, and for good reason! You can get creative and customize it however you like to make sure it is a basket all about HIM! And I just love the way Lisa incorporated her “101 Reasons Why I Love You” into the gifts she chose to put inside! 11. Roku 3 Streaming Player – Have you heard of Roku? Basically, it’s a simple way to get broadband televison into any living room. It has over 750 channels and over 150,000 movies and TV shows from Netflix, Amazon Instant Videos, Hulu Plus, and more. And my favorite feature… Roku 3 has an enhanced remote with built-in headphone jack. So when you need to keep the volume down but still get your TV fix, just plug in the included in-ear headphones. Now your hubby can crank up that late-night action movie while the kids are asleep! 12. 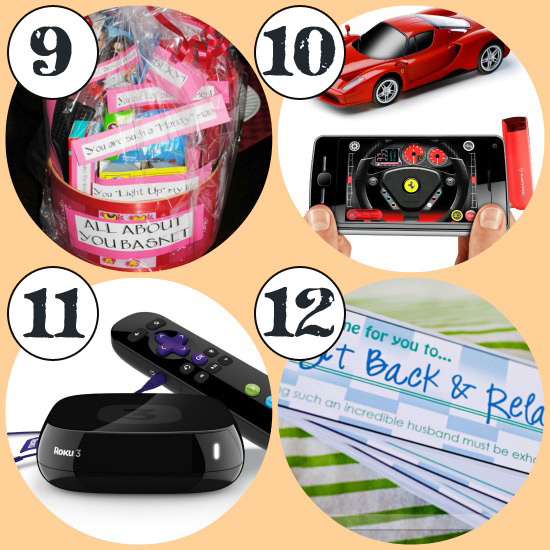 Sit Back and Relax Coupons– Your man deserves some spoiling on his birthday! And we’ve got these cute, free printable coupons to make it easy for you to do! Just print, cut, and staple to make a little “Sit Back & Relax” coupon book and treat him like a king for the day! 14. Personalized Secret Message Dress Shirt Collar Stays– Does your guy have to dress up every day for work? Why not send him off with a little love? Customized especially for your sweetheart with 6 different personalizations, flirty messages and/or names, this one-of-a-kind gift is sure to make his day! 15. 7 Days of Love– Instead of limiting the celebrations to a single day, why not celebrate the entire WEEK leading up to his birthday? 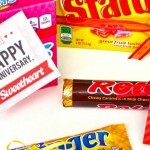 Use a standard 7-day pill box, some of his favorite candies, and flirty love notes to make it the best birthday week EVER! 16. 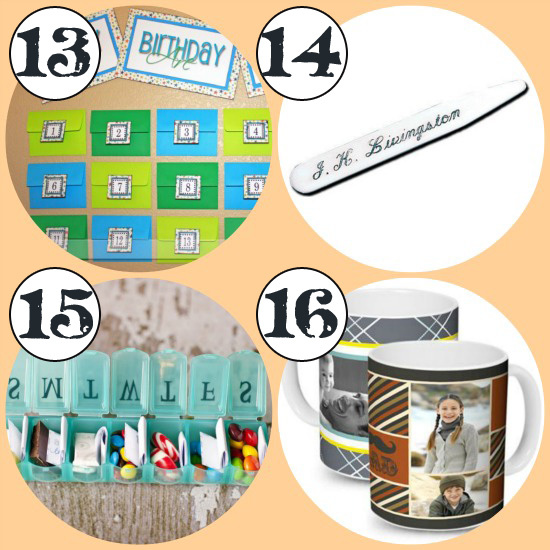 Personalized Ceramic Mug from York Photo– A personalized mug for your man is both practical AND sentimental. 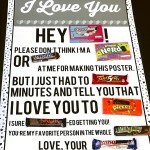 Fill it up with his favorite candies or treat for an added surprise! 17. Suite Retreat Kit – Surprise your man on his special day with a special night away! Yep, this little basket has everything you need for a night away with your honey at your own private suite for 2! And all of the free printables are just waiting for you to download! You could send the kiddos off to grandma’s for the night and turn your bedroom into your own private suite. OR actually whisk him away to your favorite hotel. Whatever the budget allows. 18. Man Bouquet– Who says bouquets are just for girls? We’re pretty sure any guy would love this fun “Man Bouquet” stuffed with his favorite candy bars, treats, and gift cards. I know mine would! 19. Cuisinart Frozen Yogurt-Ice Cream & Sorbet Maker – Now the birthday boy can make any kind of ice cream he wants to go with that birthday cake! The double insulated freezer bowl eliminates the need for ice, and the new mixing paddle makes frozen desserts in 20 minutes or less! And with a rainbow to chose from, you can pick his favorite color. 20. Passport to Love– If you really want to give your hubby the gift of LOVE, then this is the gift you’re looking for! This Passport to Love kit gives your honey his travel itinerary, airline tickets, passport, & passport stamps- so he can travel the world with you on 12 different dates. 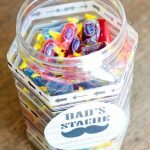 This gift is so simple and easy to put together- especially since it comes with free printables!!! It’s the perfect gift idea if you are low on money but high on love OR if you’ve been trying to get in the habit of having regular date night. 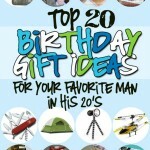 Don’t forget to check out our Birthday Gifts for Him in His 20s. 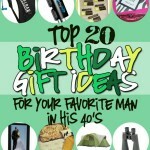 And stop by tomorrow to see our Birthday Gifts for Him in His 40s! I think I like the squirrel mask even more than the horse mask. I found my brother’s Christmas present! Thanks! thanks for this super great idea!! im so excited to do it!! im gonna do the “the all about you basket”..thanks much…GODBLESS….